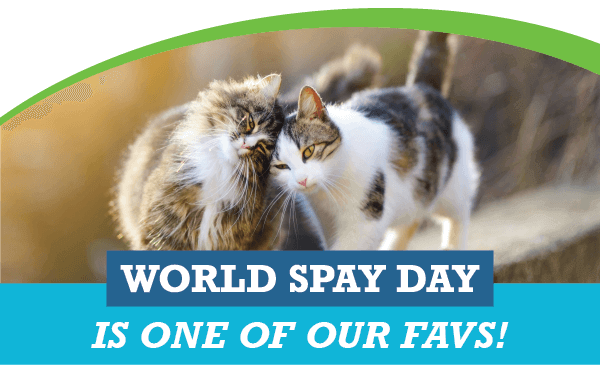 If you weren’t aware, February 26 is World Spay Day! Veterinarians love this holiday because it demonstrates responsible pet ownership. At Animal Hospital of Sandy Springs, we are big advocates for spaying and neutering your pets. Did you know that fixing your pet does more than just prevent unwanted pregnancy? There are multiple health benefits for both procedures, too, including lowering the risk of cancer, minimizing aggressive behaviors and more. If your pet is already spayed or neutered, great job! If not, there’s still time. At Animal Hospital of Sandy Springs, when you bring your best friend in to get fixed we do much more than remove their specific body parts. Our high-quality facility offers a completely safe and professional environment, unlike other lower-cost options. If you’ve got a pet who’s due for a snip, World Spay Day is the perfect time to get this done! For more information on these procedures, especially regarding timing, safety and anything else, or to make an appointment, contact us at 470-419-8259 or schedule an appointment online.